Joining Stephani with Weekend Wrap-up! Salted Dulce de Leche Swirl Brownies. YS didn't like them...I probably put just a little too much salt on the top. CH off for a bike ride. Cades Cove. One of my favorite places on earth. I probably have a million pictures, but every time I go, I have to take more. We saw the deer just as we entered the cove. The next 3 pictures: John Oliver's Cabin and a couple of views in the Cove. My dad's sister and her daughter were in for the weekend. Bottom left: the sister that gives me stuff with my cousin, who is also my birthday buddy. Bottom middle: a fly had gotten in the house, and my dad & aunt were on the hunt. Bottom right: cousin, parents, and aunt. Check out Stephani's new link-up! She's just getting it started, and would love to meet you! 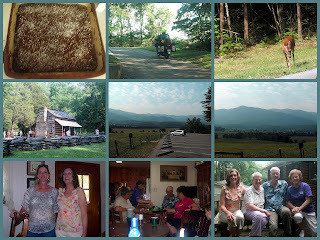 I love Cades Cove too - but get so car sick everytime I go there! BLAH! Cades Cover rocks my world too. I have done it on bike, car, convertible, horse...and love it, love it, love it. There is not many places any prettier on this earth. Biking in Cades Cove must have been just a little bit warm : ) We were just up the road. I never get tired of the mountains. Your sister and cousin look so much alike, at least in this photo. I couldn't see your photos too well and then I remembered I could click on it to enlarge it! Such pretty scenery shots. I love it when you are surprised by a dear in the road! Thanks for joining in and for your support!! Love your website. I am your newest follower, and invite you to join my blog as well. Weekend Wrap-up: a day late!